Tonight's concert was an inspiring opening to this well attended annual event, the Newcastle-based group sounding particularly well in the supportive acoustic of the sumptuously decorated Chapel. It began with one of the grandest of Handel's concerti grossi for a full ensemble of some 14 players, the (unnamed) leader of the 2nd violins duetting effectively with Pavlo Beznosuik, their tones contrasting effectively. 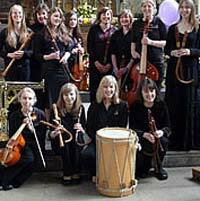 The group's eponymous composer, born in Newcastle, was represented by one of his concertos based on harpsichord Essercizi of D Scarlatti; they've been recorded by this group and others. 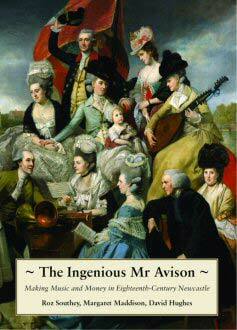 The Avison Ensemble has published this year a lavishly illustrated book "The Ingenious Mr Avison", warmly recommended. Herschel has local significance in Greenwich; his concerto of c.1760 preceded his career as an eminent astronomer who discovered two of Saturn's moons! This concerto was a charming, vivacious piece, one's only regret that the excellent baroque oboist Frances Norbury [R] did not return to take a further part in the concert. The reason for that was that there are four Seasons, and Vivaldi's Four... Beznosuik is exploring some other "fours" which he thinks deserve to become similarly popular, and for the second half he gave us an uninterrupted sequence of another group, starting with La Caccia and finishing tempestuously with La Tempesta de Mare. A very satisfying concert. November for us used to mean facing the rigours of winter in Huddersfield for their Contemporary Music Festival; latterly, it has been associated with early Music at Greenwich. This is a strange weekend, stormy weather, rivers of water down the roads with drains inadequate to catch it; waves across the pavements in the town centre as if the Thames had come into town; and some marvellous music! Friday was a mixture. In reverse order, Trinity College's Baroque Orchestra & Choir gave a good account of Handel's The Triumph of Time and Truth (1757) under Paul Goodwin, with lusty choral singing and more variable soloists, Beauty and Deceit taking the palm. With numerous microphones and loud speakers, some distortion was inevitable; it all sounds far better on her newly released and recommendable CD [The Grand Tourists in Ammonite GTR01]. Saturday, another stormy day, began with another meteorogical miracle. Arriving for the instrument demonstrations in Admirals House, across the Thames there was a huge, perfectly complete rainbow - a once in a lifetime sight ! The music given there was likewise spectacular, a series of carefully prepared 45 minutes demonstration lecture recitals representing the creations of makers exhibiting in the associated international exhibition in the Painted Hall and below the Old Royal Naval College Chapel. I attended three of those events put on by recorder makers, who were present in force and put on a splendid display of those one-time humble school instruments, developed out of all recognition in recent time. Nik Tarasov, flown in from Slovakia, gave a racy lecture in perfect English, during which he played with dazzling virtuosity many of the novelties developed by Mollenhauer Recorders, including a walking-stick recorder and later keyed models adapted to play music of the Romantic period. Julian Feltrin gave a recorder recital on instruments introduced by Philip Bolton, spanning the centuries and finishing with a showpiece Breathless for recorder(s) by Moritz Eggert, which entailed playing twos of four recorders in his mouth together - like jazz saxophonist Roland Kirk. 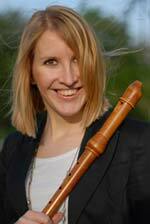 Caroline Jones, in a recital with spinet accompaniment, bravely demonstrated the qualities of Blezinger Recorders, with which she had only a few days to familiarise herself. For prize winners Hila Katz - 16/17 C keyboard music on a small single keyboard harpsichord - and pure voiced Rie Kosaka accompanying herself with riveting precision and elegance on a small medieval harp in 12/13 C songs, the ORNC Chapel was really too large. Earlier two groups of young people from Warickshire had brought there a varied programme of court and village music. The Youth Waits comprised a consort of recorders, crumhorns and viols, two charming singers amongst them; the County Viol Consort 'Gutted' introduced a convincing 21st C viol sextet by Peter Seibert and to finish, a medley of 17 C dances in which 'Gutted' joined with Youth Waits lacked only - a little more "guts" ! As Musical Pointers' sole representative, of the master classes I was able only to attend this year's harpsichord and clavichord class (another was provided on Viola da Gamba). There are always numerous simultaneous attractions to tempt you away, but this year I remained throughout the several hours, which provided a different perspective. John Henry is a unique performer/scholar who passes off his blindness with aplomb. Guided in from the back of Trinity's Theatre Studio he felt his way around the instruments and then settled down comfortably. He seemed to have known several of his seven privileged students (from the Purcell School, TCM and its Junior Department, RCM etc - how are they chosen?) and was unfailingly considerate of their varied abilities; one could scarcely get through a line of her chosen piece and several were quite apprehensive when asked to try the clavichord. Henry distinguished between the techniques required by the two instruments, and even brought into discussion the undamped "lautenwerk". He sought dramatisation from his subjects, but undogmatically - "do what works" he urged them when discussing fingerings. Some of the young and not so young musicians found it hard to adjust and become more flexibile as sought; Henry talked of "flow with speed" and, contrariwise, "lilt and focus without speed" at another point. And surely some of John Henry's masterclasses should be filmed for video; an edited version would be of inestimable value for study purposes [c.f. the Masterclass Media Foundation DVDs which should be in every conservatoire and specialist music school's library]. This prestigious event was oversubscribed as always, with an overflow audience outside the Peacock Room (several 'reserved' seats were rigorously maintained empty by the ushers !). 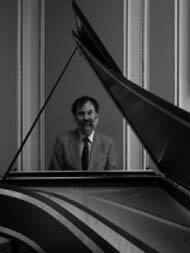 The adjudicators were chaired by Maurice Steger, a Swiss virtuoso who had given a morning recital at Blackheath Halls of 17/18 C sonatas, extravagantly decorated and tiring to watch. 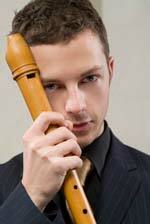 He was partnered by the calmer but equally expressive Laurence Cummings at the harpsichord; see Steger, described as "the Roger Federer of the recorder", in hyperkinetic action on a video clip*. Cunningly compiled own choice programmes (how are the contestants selected?) was the order of the day for the Moeck competition, with avant garde contemporary alongside early music and around a Telemann set piece. Two of the finalists (who are chosen from CDs submitted in the Spring) included excerpts from Van Eyck, and the runner-up enhanced interest with exotic support from a percussionist. The adjudicators noted the extremely high level this year and confirmed that it indeed was a very close run contest between the winner Pernille Petersen and Per Gross, both of whom had studied with the great Dan Laurin. I suspect that Pernille Petersen's poised charm, and the natural musicianship displayed in all her phrasing, tipped the balance. 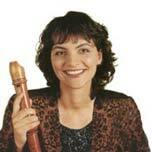 She played Berio's Gesti as music (!) and was completely unfazed by a security alert in the middle of one of her pieces, carrying straight on afterwards as if nothing had happened. I should have preferred the rules to have allowed for a draw, with invitations to them both to give future recitals at Trinity.